We’re getting the bandhas back together! Posted on 10/08/2012 by Stand and face the sun. Ugh Bandhas! For a yoga teacher, they are one of the hardest things to teach. For starters, you cannot show them to people. So You’re left with trying to explain something to people that on a day to day basis fluctuates a bit. Also, in the yoga world there’s this talk that you should be doing bandhas 24/7. That’s a tall order along with everything else we have to do. But they are interesting, and once you start to figure them out for the first couple of times, they actually become very intriguing. If you can execute them properly, they will make things easier. Maybe “easier” isn’t the right word. But instead, they will make things more accurate. Or an even better idea is they will direct your energy. When I do them to the best of my ability they seem to keep my practice on track, kind of like the way trains follow rails. But there definitely seems to be a learning curve to them. At 13 dedicated years of Ashtanga yoga practice, I think I’m still on that curve. Chaturanga Dandasana. Holding it is a good bandha check. It seems like with every new pose I take on in my yoga journey, there is a new process of learning how to use my bandhas properly. They are not as easily executed in every pose. Yes, for the most part they are an energetic movement that is inward and upward. I think of their engagement a lot like the way a suction cup engages to a surface. That when you engage your bandhas, in essence you are creating a sealing effect of keeping your energy secure, stationary. Once this seal or mudra has been executed, you then can work to direct your attention to the innate lightness we all are capable of. It’s as the yoga sutra’s say, Sutra 46 chapter 2, ” Sthira sukham asanam; a yoga asana should be steady (sthira) and at ease (sukham) at the same time.” But the most truthful part about that sutra is its order. Sthira is first, because you can not be at ease if at first you are not steady. A seal or mudra happens when two things come into agreement or alignment. Right? Your front door won’t seal closed if the door is not aligned? I know if you translate the word “bandha” you actually get the definition as a lock, like a lock at a dam. A dam couldn’t work effectively if it didn’t seal properly. In my opinion “to seal” would be more appropriate definition. So how do you get this alignment to take place, to create this sealing sensation? Let’s be real. The bandhas are more sensation then they are an anatomical action. I mean don’t get me wrong, there are specific muscles involved. But even if you know definably which muscles to contract, does that then make bandhas automatic? Absolutely not. Especially interesting is that even when we do know which muscles to activate, we don’t tend to be the most adept species at things that are subtle. We are definitely much more in tune with gross movements. But that’s the beauty and the mystery of the bandhas. Which is that they, more than anything else in yoga, are teaching us about the subtle, sensitive, and more mysterious side of the practice. Here’s another way that you can try to understand the use of bandhas in your practice. Have you learned yet how to drive a stick shift car? Just a sidebar: You should, because you never know when or why you might need to drive a stick shift car. What a process it is, right? Intimidating and yet so liberating once you master it. Well, bandhas are a lot like the clutch in the stick shift experience. You must learn how to operate it to get the car in gear and maneuver your way through traffic. Seems like it should be an easy enough process, but using two feet and one hand, all coordinated together turns out to be a lot harder then you would think. Sounds like the things we do in yoga. Sometimes yoga and stick shift driving have that feeling of trying to pat your head and rub your belly at the same time. You first have to take your foot off of the brake to get anywhere. In yoga, for some of us that means getting the “I can’t” thoughts out of our way. Doing yoga thinking “I can’t” is a lot like driving your car with your foot on the brake. Then you have to push down on the accelerator while easing off the clutch smoothly at the same time. If not, you will bounce the car forward or stall out completely. They are subtle movements, it requires a sensitivity of how much to release the clutch and how much to push the accelerator. You might think of the clutch as the mula bandha and the accelerator as uddiyana bandha. They must work in unison. You can’t have one with out the other, and you must first engage the one before you can effectively engage the other. In yoga, mula bandha is sometimes called the roots and uddiyana bandha is called the wings. You could say then that mula bandha is the element of sthira and uddiyana is the element that creates the ease of execution, sukham. Just like you have to ease off the clutch and push down on the accelerator. What’s interesting, is when you first learn how to drive a stick shift car, you are taught on a flat surface because it’s easier. But then when it’s time for you to refine your stick shift driving skills, you have to try it on an incline. It is a whole lot harder to know what degree of effort to apply to the gas and how much to release the clutch, all at the same time while worrying about drifting backwards. The smaller the hill the easier to figure out. Just like the easier the yoga asana, the easier it is to activate your bandhas. But the more things in an asana that you have to pay attention to, the harder it seems to be to remember to engage your bandhas. You put people upside down in yoga and it seems that the last thing on their radar is bandhas. Lucky for them, bandhas automatically engage a bit when inverted, not completely though. Asking people to engage their bandhas when attempting a new, more advanced asana is a lot like trying to ask the driver to take their foot off the brake when sitting on a steep hill, in a stick shift car. Sometimes we might accidentally let our bandhas out, and then our energy flows but without any guidance. However, we need to have the ability at a moment’s notice to activate the bandhas and get our energy and attention back on track. First, learn how to find and use your bandhas in easier poses, then as you advance you will know what to do with them. Bandhas are much more fun when we know how to use them to make our practice freer and lighter. Bandhas are most effective when activated together. You may not remember this cartoon from the 1970’s; The Super Friends. It had these two characters named the Wonder Twins. According to wikipedia “The Wonder Twins powers are activated when they touch each other and speak the phrase, “Wonder Twin powers activate!” This phrase is unnecessary and just a habit of theirs. Physical contact, however, is required. If the two are out of reach of each other, they are unable to activate their powers. As they are about to transform, they would each announce their intended form. “Shape of…”, “Form of…”” Our Bandhas are a lot like that. They need to operate together .And when we do activate them, they allow us to take on new forms and shapes. 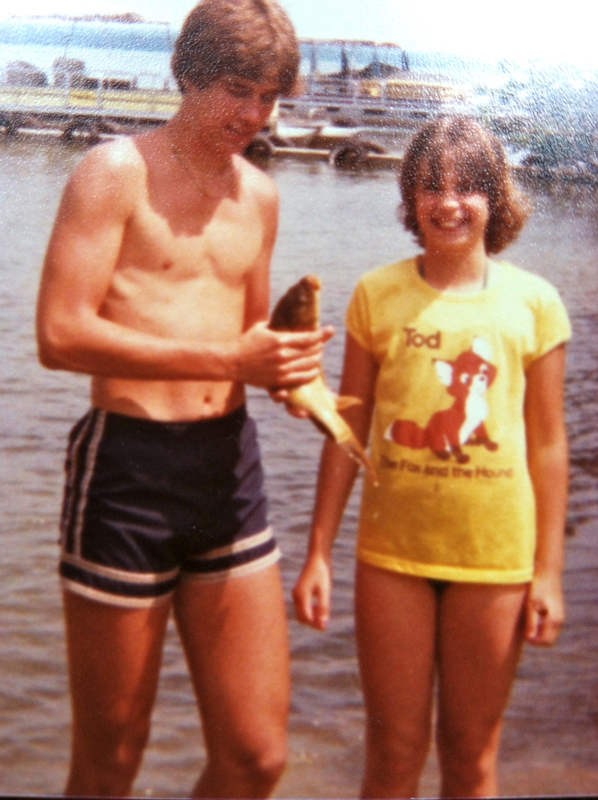 Me and my brother just before releasing the fish I caught the summer of 1980. I’ll give you one more story of how I see the bandhas operating before letting you run off and experiment with the cause and effect of bandhas in your asana. Have you ever been fishing? When I was young and before many years of being a vegetarian, I went fishing a few times from a shore of Lake Pymatuning, in Ohio. Nothing fancy. We used the worm, weight, and bobber system. In order to catch the fish we needed the worm to dangle below surface, so we put a tiny weight on the fishing line. Nothing that was too heavy that would cause the line to drop to the bottom of the lake, but enough weight to give the look of the worm dangling. Then a foot or so above that on the line we attached a plastic red and white bobber to allow the line to float so that we would be able to see when the fish took the bait. The weight on the line is your mula bandha and the bobber giving the line buoyancy is uddiyana bandha. We must be grounded, but buoyant in our asana’s. Just as it can be tricky to catch a fish, it will be tricky to catch your lightness of being. As my teacher, Tim Miller says “somethings in yoga can be taught but other things must be caught.” Go fish for your bandhas. Be patient, be sensitive and don’t be too attached to your results. Sutra12, Chapter 1, “Abhyasa vairagyabhyam tannirodhah; Steady practice, with non-attachment, will stop the mind from fluctuating.” Just as I let go of all the fish I did catch, we need to learn to let go of our expectations. If you always want to go fish for the biggest fish out there, you might miss out on the beauty of the little one’s. So let’s get the bandhas back together and make another great album. Maybe we’ll call this bandha album, THE ROOTS and WINGS, or THE CLUTCH and ACCELERATOR, or The WONDER TWINS, or The WEIGHT and BOBBER? But no matter what you know or think you know about the bandhas, they are definitely worth your consideration and examination. Whether you think of them as a suction, clutch, roots, wings, super hero powers, weight and buoyancy, or anything else creative you have heard, they are a necessary tool to the practice. Before you know, it you will be reeling in your bandhas. They will help create a greater mastery of the mystery.